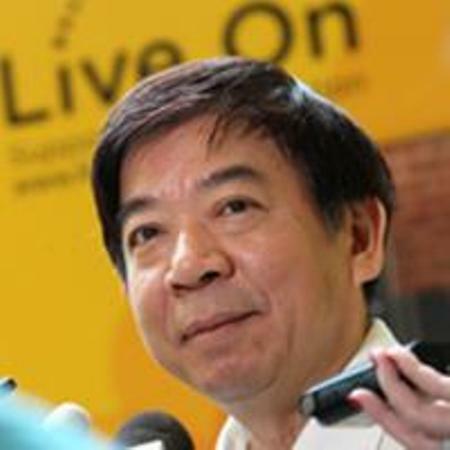 Transport Minister Khaw Boon Wan who drew flak this week for saying that MRT reliability has improved by three times since he took over the ministry and that all five MRT lines have improved, also faced off with mainstream media by claiming that reporters sensationalise MRT breakdowns. “I wish it was so simple. If it were so simple, they don’t need us. We can ask the reporter to run the train system,” he quipped. However, does the minister’s beliefs hold any truth? Of course the minister’s remarks about MRT reliability does not match sentiments on the ground – especially when he claims that the number of major delays exceeding 30 minutes has decreased from 10 in the first half of 2016 to 3 in the first half of 2017 when in reality, this number is moot since the data collected does not include delays due to re-signalling works on the North-South Line. So Ashley Wu is right – interviewing people about how breakdowns affect their daily lives is not sensational. However, it does matter who is being interviewed and why they specifically are being interviewed. 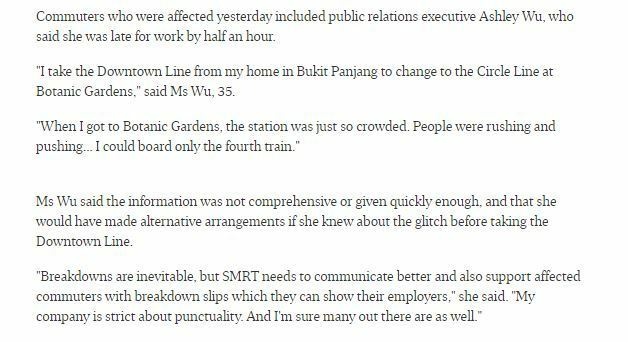 So when the mainstream media keeps quoting the same alleged commuter on transport issues, one will surely wonder if the media is really objective when covering train breakdowns or trying to suit an unknown agenda. 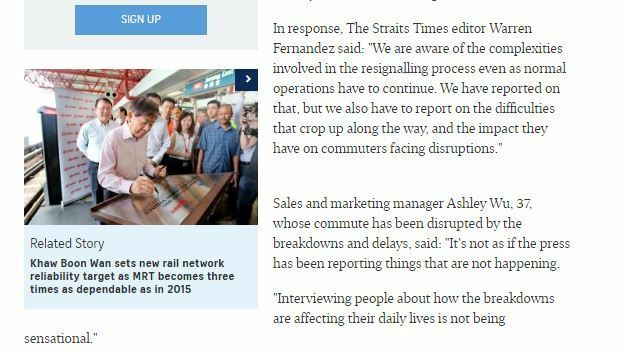 Ashley Wu, for instance, has been quoted at least 6 times on transport issues by the Straits Times since late 2016. 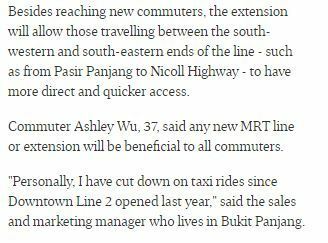 Ashley, who has been reported to be a Bukit Panjang resident, has been interviewed extensively by the Straits Times which has devoted considerable space on its papers for the views of this one commuter. 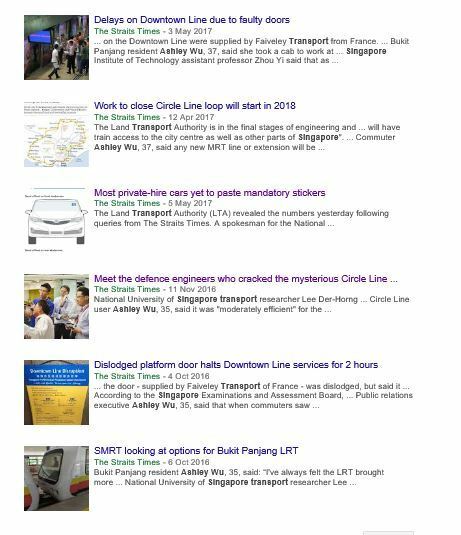 The paper has so far featured Ashley’s complaints about the Bukit Panjang LRT, Circle Line track faults, Downtown Line train delays, and even about private-hire cars that have yet to feature mandatory stickers on their vehicles. 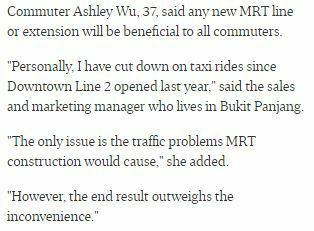 Ashley always seems to have something to say and, interestingly, whatever she says happens to fit perfectly into any Straits Times transport article. 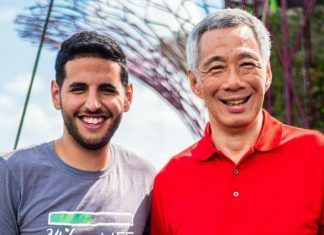 While it is unclear exactly who Ashley Wu is and why she is so prominently featured in the Straits Times, netizens have began dubbing Ashley “Singapore’s only commuter” after stumbling upon the fact that the paper appears to regular feature Ashley’s views as representative of the ground. The hashtags #AshleyWuAreYou and #AshleyWuTheOnlyCommuter are being floated by some amused netizens online.